5" x 5" x 2" White Freezer Boxes with 81-cell divider. 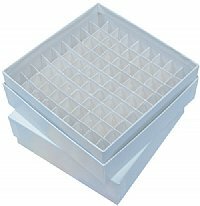 Size (ID): 4-15/16" x 4-15/16" x 1-7/8" (OD): 5" x 5" x 2"
Perfect for Biological Sample Storage or vials in various storage racks. White in and White out. Ships assembled. Minimum order is 12.